It always intrigues me how certain bits of cultural material can TRANSFORM over time, sometimes after having been carried to new environments, borne by the winds and currents of history. These metamorphoses remind me of the game called DENGON GEIMU (伝言ゲイム) in Japanese (I can’t recall the English name at the moment- the Telegraph Game….. Chinese whispers?) in which two or more teams form their own lines and the referee whispers a word or phase to the person at the head of each line. This then has to be passed down to each team-mate by whispering into the next person-in-line’s ear. It is always amusing to hear how the original words have evolved, often unrecognizably, by the time they get conveyed to the last person in the line. I was thinking about that game after having stepped into Tsukuba’s Seibu department store this morning. I had wanted to do a little shopping and entered the ground level food department without being conscious of what day it was, or rather, what DAY BEFORE it was. I was quickly reminded. It was February the 13th — the day before Valentine’s Day (Barentine Day, in Japanese). 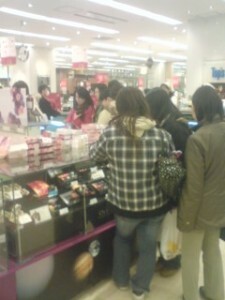 The ground floor was absolutely packed with determined-faced women, doing their last minute chocolate shopping. For the occasion, various chocolate makers had set up temporary booths. The great concentration of fancy confections was enough to make anyone with a serious sweet-tooth swoon. 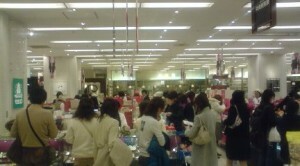 The ground floor of the old Seibu Department Store in Tsukuba is filled with temporary chocolate vendors and Valentine Day shoppers. Newcomers to Japan would certainly wonder what was going on, and upon hearing an explanation, might shake their heads in surprise. You see, in today’s Japan, Valentine’s Day is celebrated in a unique way. Instead of the exchange of messages and gifts between lovers (and family members) which is now customary in the West, it is the WOMEN ALONE who do the giving — and the gifts mostly consist of chocolate. Moreover, the recipients are not only lovers, fathers or brothers — but sometimes all of one’s male colleagues or associates. This makes for lots of pre-Valentine’s day stress AND for huge business. In fact, the chocolate makers make a large proportion of their sales in Japan during the Valentine’s Day period. Back to the DENGON GEIMU. It is always amazing for me to think of how the EXTREMELY popular ancient Roman festival of Lupercalia, a 3-day period of purification and prayer for fertility held in mid-February has survived in mutated form, in so many places around the world — including Japan where it has taken on it unique characteristics. In ancient Rome, Lupercalia was celebrated with animal sacrifices and young men running through the streets with bloody strips of goat-hide, with which they would slap any women they encountered, believing this would make them fertile. During this time, certain couplings of young people were made, by lot, forming temporary MARRIAGES (year-long sexual unions). As you can imagine, the early Christian Church did not approve of these goings on, and Lupercalia was officially banned in the 5th century. Such popular events do not die easily, however, and this ancient celebration of spring and fertility lived on in the consciousness of the people. The aspects which made it reprehensible to the church, especially its overt sexuality, were sublimated, and mid-February came to be a celebration of romantic love. The name Valentine was merely taken from the name of a saint martyred on the same date as the old Lupercalia Festival (and in fact there is more than one St. Valentine). Certain legends also arose to connect this name with LOVE. For example, it is said that Valentine was a priest who continued to perform marriages even at a time when a certain emperor had forbidden doing so (he thought he could draft more soldiers that way). While in prison, the priest sent a letter to his beloved, and as the story goes, he signed it “YOUR VALENTINE”. To make a long story short (for this blog posting), mid-February celebrations of LOVE survived the centuries and then really took off in the US in the mid-1800s, with the introduction of the Valentine’s Day card. Later, in the 20th century, besides the exchange of love letters, it became popular for lovers to exchange gifts, especially candies, flowers and chocolates. Valentine’s Day was also deemed an appropriate occasion for a romantic dinner or excursion. With Japan’s rapid post-war economic growth and Americanization many American customs, especially those which induced shopping (e.g. 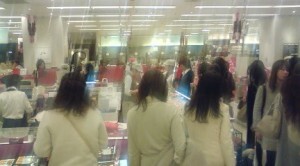 Mother’s Day, Father’s Day, birthdays, Christmas) were promoted by certain Japanese companies. In 1960, the Morinaga Chocolate Company * began its campaign to promote St. Valentine’s Day. Just how they hit on the idea of having only the women give chocolates to men is something I have yet to uncover. If you get a lot of chocolate this year, you can relax for a while and enjoy it. But remember, this is Japan, and gifts also mean OBLIGATION. Next month, that is March 14th, is White Day, the unique Japanese occasion on which you are expected to return the gift, usually with white cookies or chocolate. I will see you guys on the ground floor of Seibu Department Store next month. The ancient Romans would surely be surprised to know how their beloved festival is celebrated in Japan. It has been a long, strange journey from men slapping women with strips of goat in ancient Rome to women giving men chocolates here in Japan. More on White Day here. 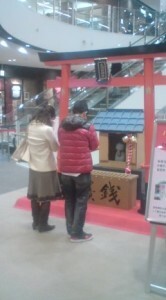 Another interesting Japanese twist to Valentines Day- a small shrine set up in the IIAS Shoppng Mall in Tsukuba, for those who would like to pray for a partner- or the successful continuation of a current relationship. 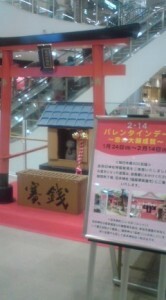 The shrine is also touted as being useful for passing entrance exams. 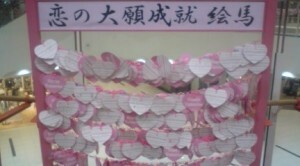 Some of the hundreds of wishes hung up by the special Valentines Day Shrine at the IIAS Shopping Mall in Tsukuba. I peeked at a few. One example was- I`d like to get to know M-Chan better ! K. T.
* The Morinaga Confectionary Company, the first to promote Valentine`s Day in Japan is closely related to Akie Abe, Prime Minister Abe`s wife. Her father was once the company`s president. My granddaughter finally made 120 chocolate-cakes, before that she had made 120 of failures, now her grand parents and aunt have to taste 120 of failed ones, for us those are acceptable.Just to be afraid weight gain.